Do you want more traffic to your blog? Are you Struggling to promote your blog? Then you are on right place you will get here some simple ways to promote your blog. 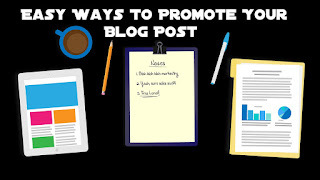 Especially, new bloggers don't know how to promote a blog.If you are also a new blogger then this post will help you to promote your blog and increase organic traffic. Here I am sharing some simple tips which I am using to promote my blogs.These tips are really useful for a new blogger and easy to implement. Social media share is the great way to drive traffic to your blog. So many bloggers are getting huge amount of traffic from social media only. If you have a good number of followers or likes on your social media profiles or page then it will definitely drive a good amount of traffic to your blog. So after publishing a new post share you post on various social media profiles. Getting traffic from email subscriber is the great and easy way.Every pro bloggers have a huge number of subscriber and they are getting a good amount of traffic from email subscribers only. So you should enable Email Subscription widget on your blog. If your blog content is good then readers will subscribe to your blog.So you should write quality and actionable content. Readers will never subscribe to your blog unless they find your content is useful to them. It is an another effective way to Promote Blog post. It will bring you traffic and also help in getting a higher page ranking. Guest posting is a great way to get your name out there and drive traffic back to your own blog. If you have good writing skill then you can write guest posts on other blogs related to your niche.Make sure you have included one or two your blog link to that post. Blog commenting is the essential step to improve your blog ranking.Since backlink is the most important factor for off-page SEO and if you want to run long term blog then you should make backlink through these methods only(Blog commenting & Guest Posting). Don't make huge backlinks in a single day.You should make backlink daily basis.It will help you to rank your post higher as backlinks are the major thing Google wants for listing your blog. So make a habit of commenting on other blogs. Getting traffic from forums is an excellent way. Join few forums and when a forum member post any query on the forum then you make a response to that including your blog link. This increases your backlinks also. By this way, you can get huge traffic from forums only. Make a youtube channel with your blog name and explain your blog topic in your videos. You can also include your blog post URL in the description box of that video. Because some people prefer to watch videos instead of reading.And you can also monetize your videos with Adsense. So make your youtube channel now and get some extra traffic. After publishing your post you can share your post on related Google+ communities.You can also make your own Community. Join communities that are related to your blog niche and post your new post link but don't do link spamming. Post your link on at least 4-5 communities.This way you can increase your traffic. These are some tips from me which you can use to promote your blog.Share some other tips do you recommend in the comment box. I hope The Ultimate Guide To Promote Blog Post was helpful for you.So now please share this post using share buttons below.